Visual Studio Code>Other>Local HistoryNew to Visual Studio Code? Get it now. A visual source code plugin for maintaining local history of files. 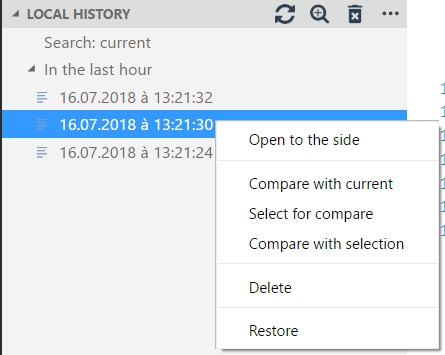 You can easily navigate between history files with the local-history tree in the explorer pane. When you click on a file, a comparaison with the current version is displayed. You can also access other commands via a context menu. The files displayed depend on setting local-history.maxDisplay to see more, use search-plus icon.